You may have noticed that pretty much every post we have written about Hong Kong to date has mentioned food. This was not an accident. We visited Hong Kong with the goal of eating as much as humanly possible, and although other elements of the city charmed us, the food definitely did not disappoint and remained a major highlight of our time there. 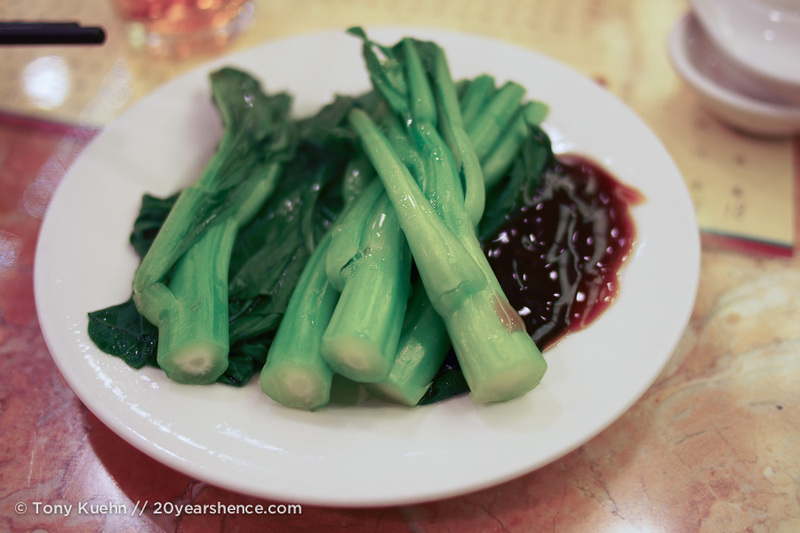 We’ve already shared our experience eating at two Michelin-rated dim sum in Hong Kong, but indulgent diners that we are, we actually ate a two other restaurants you’ll find in the Michelin guide… both by chance, and both excellent! Our first proper meal in the city was had at Ho Hung Kee, a little hole in the wall that is located just off of Times Square. Like moths to a flame, its garish neon sign beckoned to us, and we soon found ourselves sharing a table for four with two other strangers. We ordered up a piping hot bowl of wonton soup, a plate of stir-fried Chinese greens, and some pork and egg noodles slathered in a virulent neon spicy sauce. Regardless of the acccolades bestowed upon HHK, the food was humble but packed with flavors. Unlike Chinese food back home that can be gloopy and heavy, the flavors here were crisp and clean. After a month of eating delicate and subtle Japanese food, the flavors here packed a huge wallop and certainly startled our tastebuds to life! Our personal mosquito light… zzzap! Our next Michelin meal was the fanciest of the bunch, though just barely more expensive. 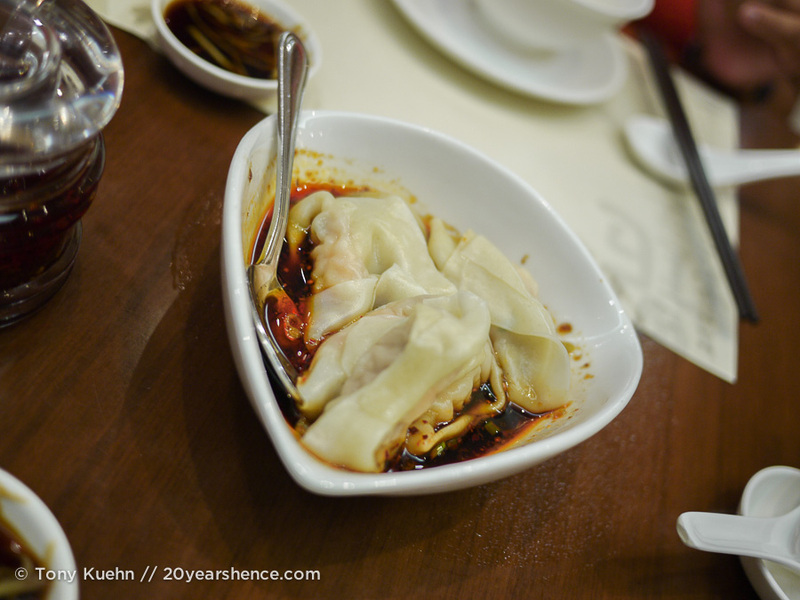 Determined to eat our weight in dumplings, we tried out a place called Din Tai Fung, located in Causeway Bay and not a 15 minute walk from our hostel. What we didn’t realize until afterwards is that DTF is actually a Taiwanese chain, although only this particular location has been awarded a Michelin star. 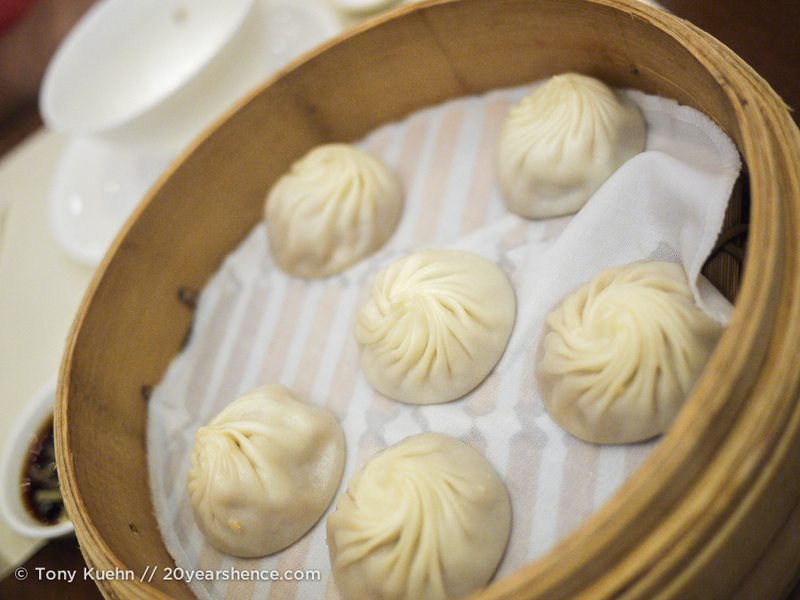 We did, however, know enough to order the famed xiao long bao (soup dumplings), along with a chilled bean sprout and bean curd salad (we had to order something healthy), shallow fried pork dumplings, and an order of noodles topped with a pork & black bean sauce. The food here was out of this world, and every bite we took was an explosion of flavors and everything was cooked to perfection. 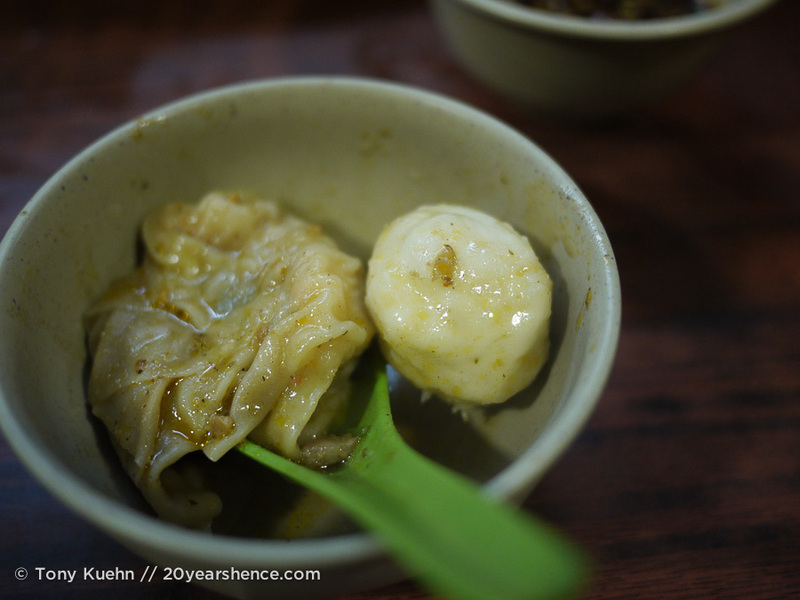 Though DTF is famed for its xiao long bao, our personal favorite dish from this meal was the spicy shrimp & pork wontons, which were exquisitely plump and juicy and drizzled in an addictively delicious sauce that made our lips tingle. We couldn’t get enough of it, and ultimately resorted to spooning this sauce onto the other dishes we ordered! Some people might be disappointed to learn that this amazing food came out of a chain restaurant, but we are just excited to know that as we travel around Asia, there will be more DTF in our future! 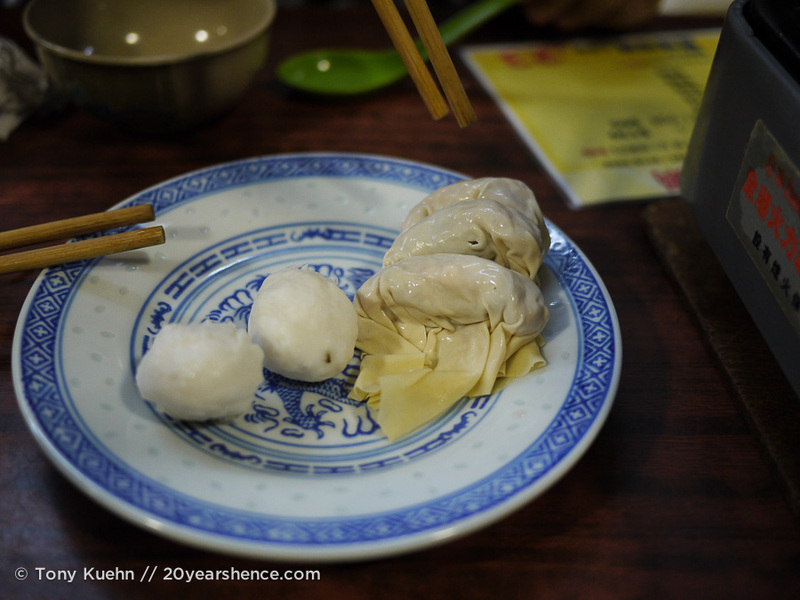 Before eating a single meal in Hong Kong, we were already self-professed dim sum experts. We were far less familiar, however, with the other strains of food that form the backbone of the Hong Kong culinary scene, and sought to rectify this oversight. 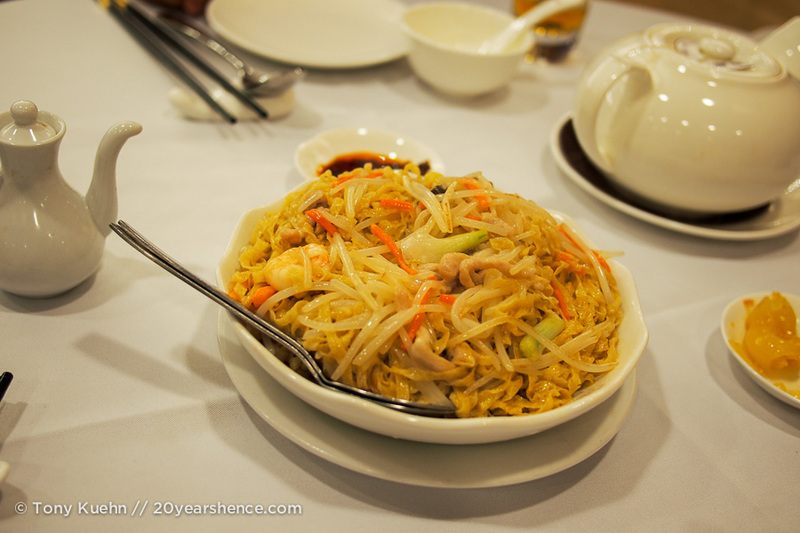 We began our foray with a visit to a well-respected Chiu Chow restaurant. 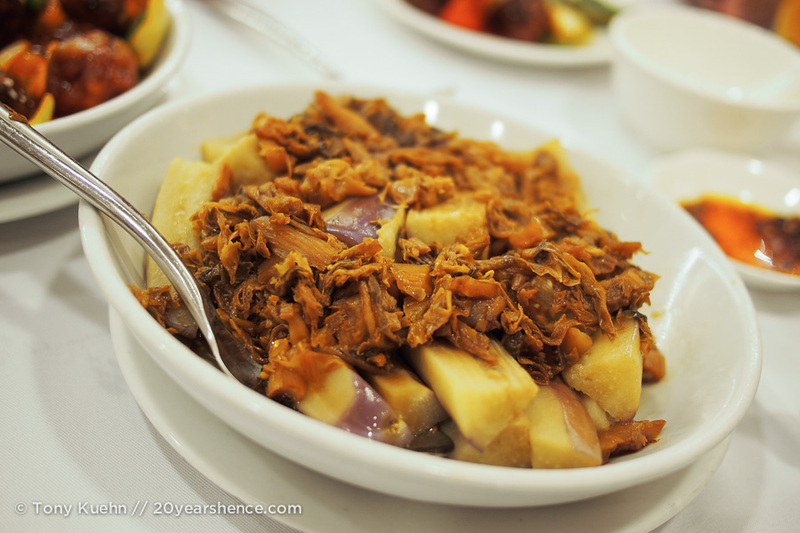 Apparently Chiu Chow food is, like so much Chinese cuisine, the result of several regional styles of cooking blending together with a Cantonese twist. It is generally promoted as being beneficial to one’s health, and is more delicately seasoned than other types of Chinese cooking, relying more on the natural flavors and freshness of the ingredients to elevate the dishes. We can’t remember what the English name of this restaurant was, but if you ever see the sign to the right, you’ll know you’ve made it to the right place! For our feast, we ordered eggplant with fermented vegetables, fried noodles in the chiu chow style, and sweet and sour pork. The latter we ordered at Tony’s request as S&S pork is one of his favorite guilty-pleasure foods back home and he wanted to see how the version he was familiar with measured up to the original. Although this version was lighter and more sophisticated than what we get back home, we could definitely see how it had evolved to become what Westerners know. This was true of the other two dishes, which were reminiscent of dishes we had eaten previously, but with a lighter touch. The dishes were all quite simple, but simple doesn’t mean boring or bland! No, the flavors were still very complex and deep, which might explain why we did our best to east as much of these mountains of food as we could, despite it clearly being enough for a party double our size! An added bonus to dining here is that the service was phenomenal: we were waited on like royalty, although we felt like bumbling fools who didn’t know the proper etiquette. For instance, alongside our plates, we were each given a small bowl as well, whose purpose evaded us. We just plonked our food down on the plates, but we soon realized that Asian diners tend to dish the food into these individual bowls instead. Thankfully, our fears about embarrassing dining gaffs were laid to rest when we met up with our friends Yetta and Alan (they of the wonderful Chi Lin Nunnery suggestion) the following evening. Hong Kong natives, the two assured us repeatedly that when it comes to dining in China, anything goes! Put your food on a plate or in a bowl, spit your bones directly on to the table… no one will be offended, as they’ll be too busy eating and doing the same. Dinner that night was at a Hakka-inspired restaurant called Jasmine Garden, located in the Langham Place Shopping Mall. Coming from the U.S. & Canada, we are not accustomed to mall food being anything other than low brow affairs, but this place was wonderful! Thankfully, Yetta & Alan took the reins when it came to ordering, although Tony did select the tea (and did an excellent job of it), and we also picked out a few dishes we wanted to try. The resultant feast was incredible, and we got to try several dishes that were completely new to us, such as a black bean soup (also meant to boost your health), a pumpkin & peanut pancake (often eaten as dessert, but which fit in perfectly with our other dishes), and the infamous bitter melon. The name is not a misnomer as this melon certainly is bitter, and while we are sure it is touted as having many health benefits (why else would anyone eat it?!? ), it is also something of an acquired taste. To round things off, we also at the restaurant’s special suckling piglet (so crispy & decadent! This was Tony’s choice), spicy duck (just the right amount of heat! This was my choice), and a fragrant rice (because no Chinese meal would be complete without it!). In the end, the food was rivaled only by the company, which was truly excellent. One of the nicest things about this trip is not just having the chance to make new friends, but finding ourselves in the position to reconnect with and visit old ones who we would not normally see. We are so happy we got to share this meal with Yetta & Alan, and can’t wait to treat them the next time we visit (and there will absolutely be a next time!). 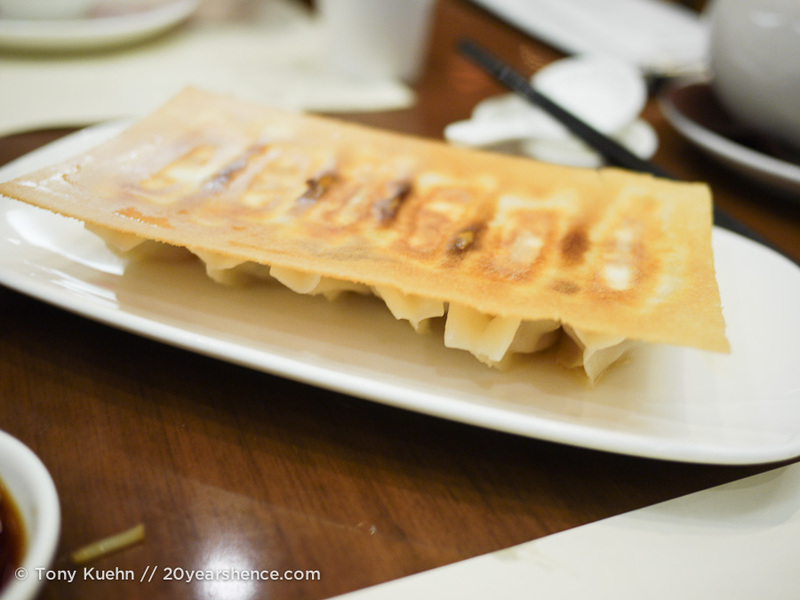 Having toured some of Hong Kong’s historic food roots, we also made sure to try some of the more modern fare. 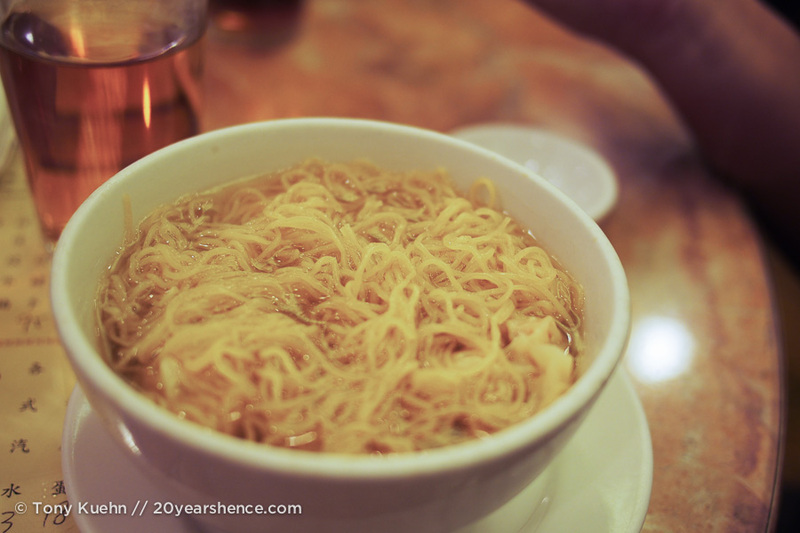 One thing locals will tell you to try in Hong Kong is food at one of the many diners. Though the insides look pretty much like diners back home, the food here can only be classified as Crazeball Fusion; it is obviously comfort food run amok! 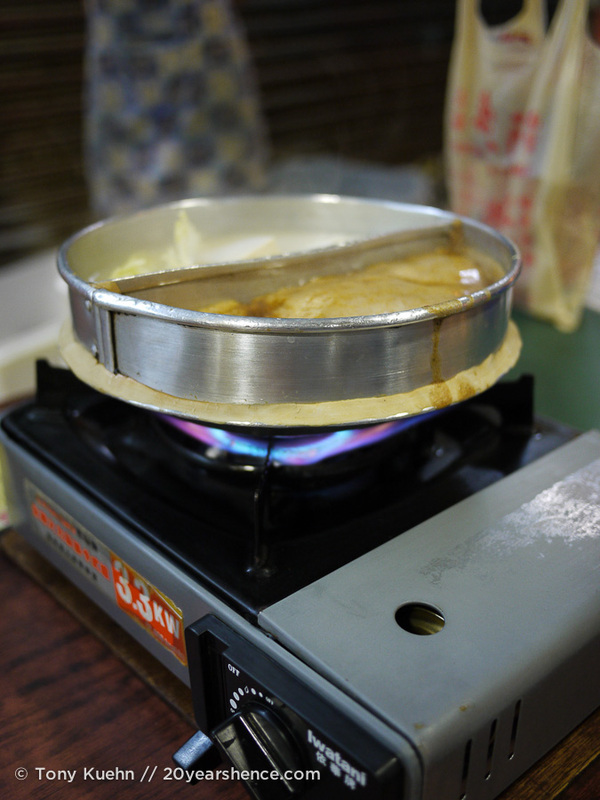 They serve pretty much everything under the sun (often with odd twists, like peanut butter toast drizzled with condensed milk) at bargain basement prices, and most joints are open 24 hours a day. We ordered a plate of mixed braised veggies (which we somehow forgot to photograph, but it was a fortifying mix of broccoli, onion, and various wild mushrooms), a pork cutlet sandwich (accompanied with fries & REAL ketchup! 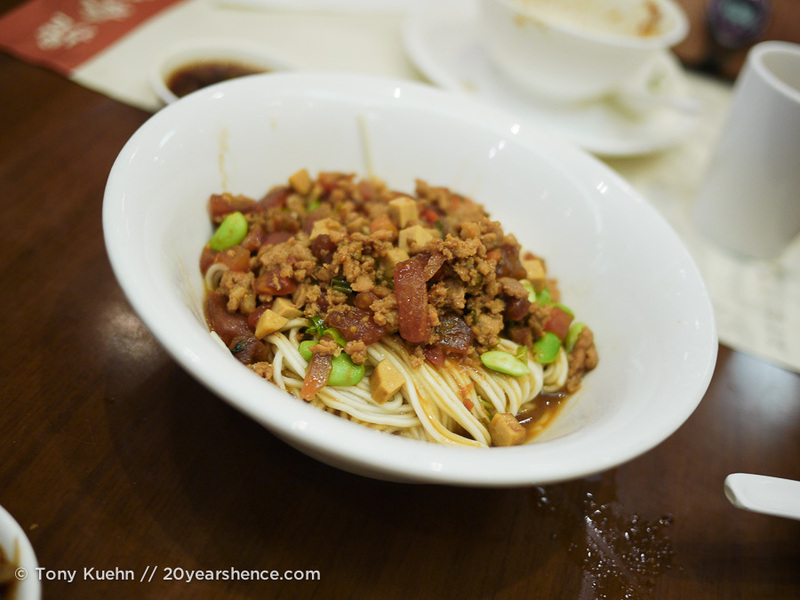 ), and shrimp and noodles in XO sauce (simply delicious and the shrimp were wonderfully juicy). We also ordered 2 delicious teas to accompany our meal, one which was an almond milk & egg white concoction (super weird, but not as bad as you would think) and another that was sweetened with longan fruit. I’m sure this meal was not one of our healthiest (though I did make sure we got our serving of vegetables), but it was undeniably delicious, and super cheap to boot. The number of restaurants in Hong Kong is mindboggling and as a tourist it can be hard to know which ones are worth frequenting. Thankfully, early on in our visit we discovered the site Open Rice, which is the Asian equivalent of Yelp and provides user submitted restaurant ratings. Many of our restaurant selections were based off of this, but there are plenty of little establishments that we wandered into just on whims because the food looked and smelled good. 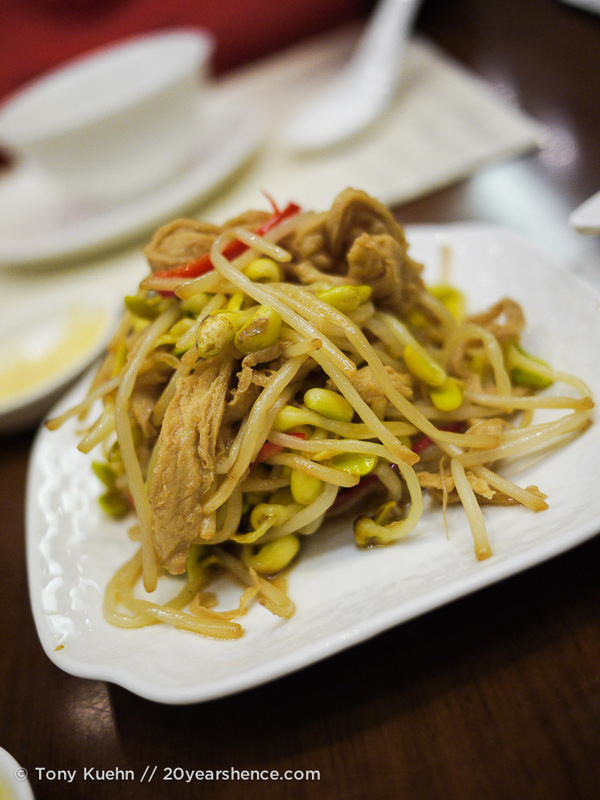 Three such places we ate at served up rice plates that you can find all over the city. Following our tour of Victoria Harbour, Tony chowed down on a plate featuring vegetables, Chinese sausage, duck, & some roast pork. We found this by looking at the non-tourist menu, which was (in)conveniently not in English, but had pictures and we do know how to point. Food on this menu was delicious and half the price of the things on offer on the English menu, where just to get some pork would cost $65HKD (~$8USD). This plate was more than enough for the two of us and only cost $48HKD (~$6USD). On our way back to the MRT, we picked up a refreshing glass of mango juice with mini sago pearls in from a street side vendor, which ensured we headed off to bed that night in utter bliss. 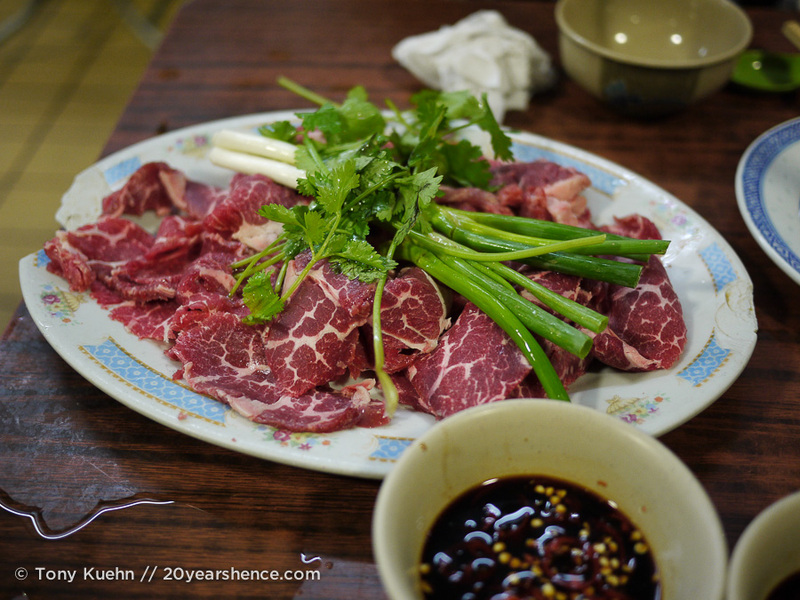 At another similar BBQ place, we picked up plates with suckling pig & rice and stirfried noodles for lunch one day. Although we didn’t always find this to be the case in Japan, in Hong Kong, if you see a place is filled with people, chances are it’s worth stopping and trying something there. In most cases, the food is tasty, filling, and best of all: cheap! We weren’t scared of al fresco dining either. In the evening, many restaurants located on quiet streets set up tables and people dine on their doorsteps. It’s great for people watching and interacting with the locals, and the food can be just as good as more standard restaurants. One night we stopped at a place where Tony had some roast duck and rice, while I was gutsy and ordered a soup filled with brisket, tripe, tendon & noodles. 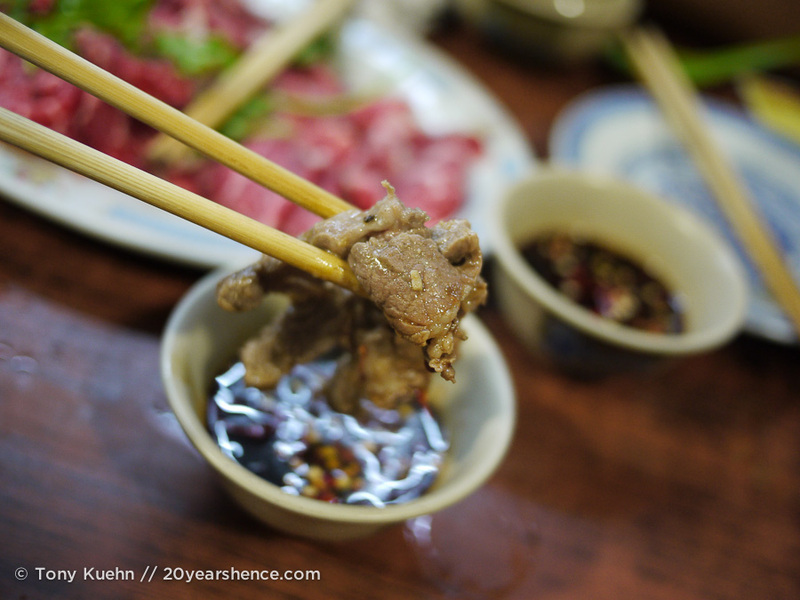 The broth was nourishing, the meat luciously tender… this was heaven in a bowl! Our adventurous eating didn’t stop there, though. 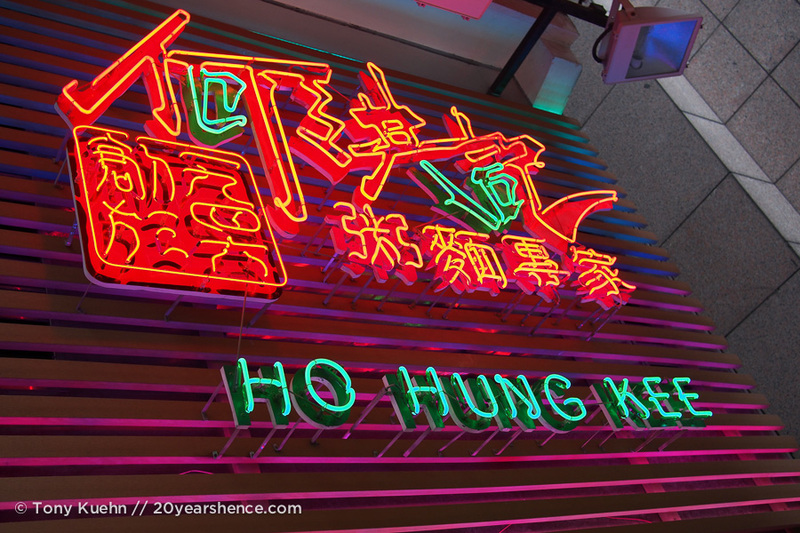 Some online sleuthing had revealed that some of the best food in the city can be found in Kowloon City at the Municipal Building. We were lead to believe that there woudl be many stalls and vendors, but when we arrived there, we only found two: one serving Thai food and one serving hot pot. In case you didn’t know, hot pot is all the rage in Asia, though Tony and I are generally far more ambivalent about it. Still, we decided to give it a go as we were starving, and that is when our adventure began: the first person who approached us spoke to us exclusively in Cantonese, which obviously wasn’t going to work. We did manage to convey that we had no idea what we were doing, and she ran off to fetch the owner, who took us under her wing. 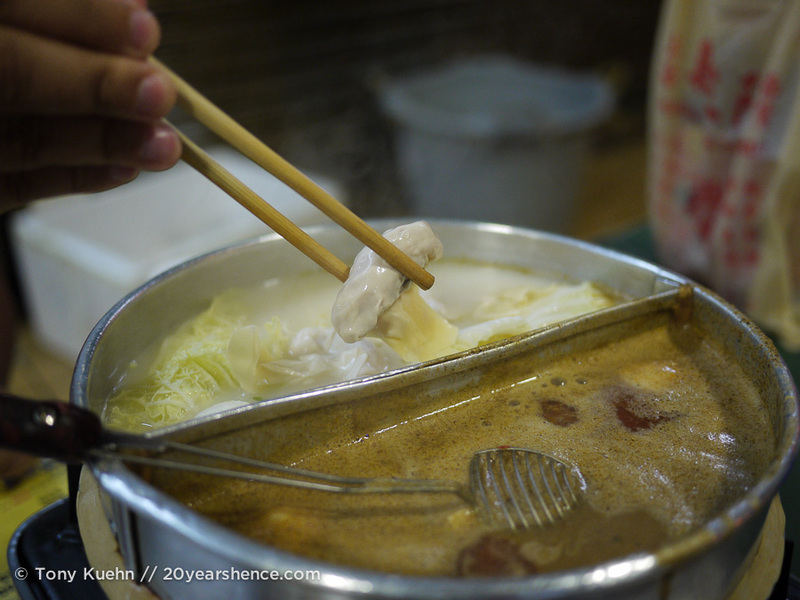 She set us up with shrimp dumplings, fish ballas, beef & lettuce, and a bubbling cauldron with two different broths. The satay-infused one was by far our favorite as it was the most flavorful (and not at all spicy), and it was a lovely complement to the beef which was tender and clearly of excellent quality. This wound up being a really fun dining experience, especially as we were the only foreigners there! A month ago, this probably would have been far too intimidating for us to try, but there really is something liberating about saying “I don’t know what is happening!” and throwing yourself on the mercy of strangers to take care of you. So far we have found that people are only to happy to help and are always excited to teach us about their culture and their food. If there was one downside to our time in Hong Kong, it is only that we spent the last three days of it incredibly sick. Having the flu while cohabitating in a 9-person dorm is surely a torture reserved for people in the inner circle of hell, so clearly we did something very very bad in a previous life. But if there was one upside to our being sick, it is that it limited our dining options to anything within a 1-block radius of our hostel and also had me craving a big bowl of soup. Lo and behold, there was a ramen shop just around the corner from where we were staying! Oddly, while in Japan, we did not eat an awful lot of ramen – in fact, I think we only ate it once! Digging into the steaming bowls here in Hong Kong, I can’t imagine why, because this stuff is goooood. Tony ordered a standard ramen with a slice of pork belly, whereas I went a slightly more exotic route and gambled on the black ramen with shoulder… this turned out to be a ramen loaded with squid ink pasta, black sesame, and heaps of garlic. It was amazingly rich and the noodles were perfectly cooked… for a simple bowl of soup, this was some damn exciting eating. I still dream about this bowl of ramen sometimes, and just wish it hadn’t taken being violently ill to get it into my belly. Quite honestly, I have a hard time imagining how ramen in Japan could have been any tastier than this! 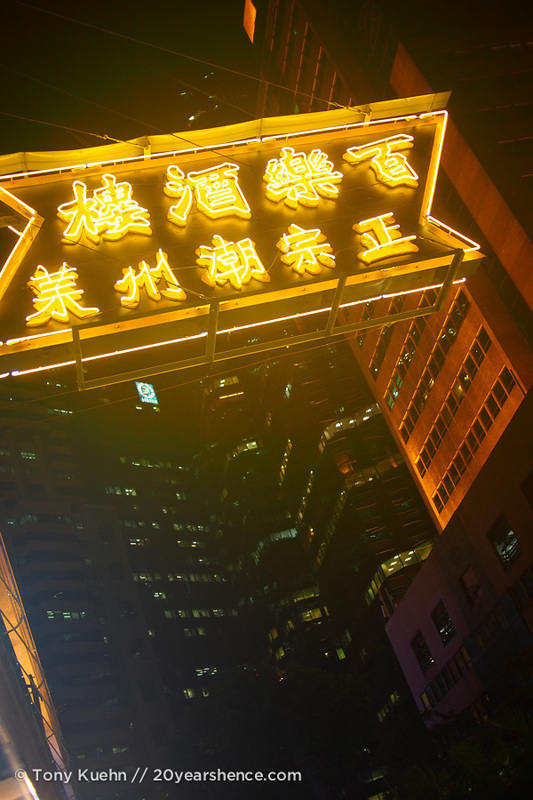 Tell us: have you ever been to Hong Kong? If so, what was the best thing you ate? If not, which one of these meals would you consider hopping on a plane for? I’m very glad that this weekend we’re going to dim sum in Seattle. Although it won’t be nearly as good (my god, it all looks AMAZING), it’ll at least help the incredible craving I have now to eat everything you just posted. Wow. Wow, which dim sum restaurant did you go in Seattle? I love “Jade Garden” in China Town district! Oh my goodness, I’m heading to Hong Kong for New Year’s Eve in just a couple weeks and can’t wait to eat my way through the city — even though I’ve been before I’m always looking for new places to try and will be keeping this page open for reference! I think my biggest struggle on returning to HK (and I am sure I will be back one day!) would be in going back to all of these places to eat the exact same stuff all over again, or to branch out and discover new delights… I look forward to hearing about your own gastronomic adventures! Ummm, WOW!! All this looks amazing. I am seriously missing good Asian food here in the US! 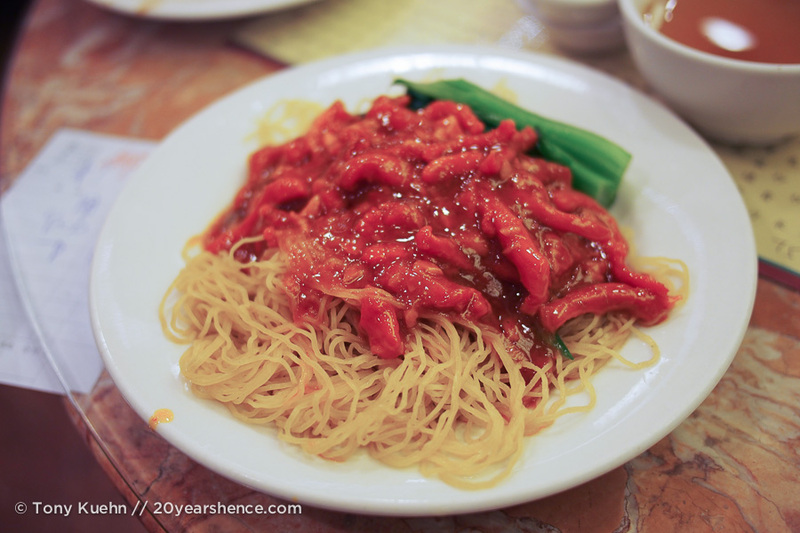 You guys should go to Chinatown in Bangkok when you get there– obviously I have no idea how good Chinese food is in Hong Kong/ China but I found the food there to be really excellent. I am sure we’ll check out Chinatown when we hit up Bangkok… though I have a feeling we’ll find it difficult to take a break from delicious Thai food! Thanks for the suggestion! It all looks insanely good. Funny thing is this: I was walking around Central World Mall earlier today in Bangkok and came across Din Tai Fung, a restaurant I had heard about, but never knew where it was in Bangkok. I looked at the menu, and nearly ate there, but then decided it would be better to come back at a more special occasion. Glad you guys loved it so much. I can’t wait to try it out (though the Bangkok branch may not have any stars)! It seems like DTF menus vary ever so slightly based on location, so I’d be curious to know what special dishes are included on the Thai menu! It’s definitely pricier (though not horrifically so) than some places, so saving it for a splurge/special occasion is probably a good idea! Once you eat there, you will be addicted! You certainly had a foodie good time in Hong Kong!! I would love to try th egg plant with vegetables, sounds interesting and vegetarian!! 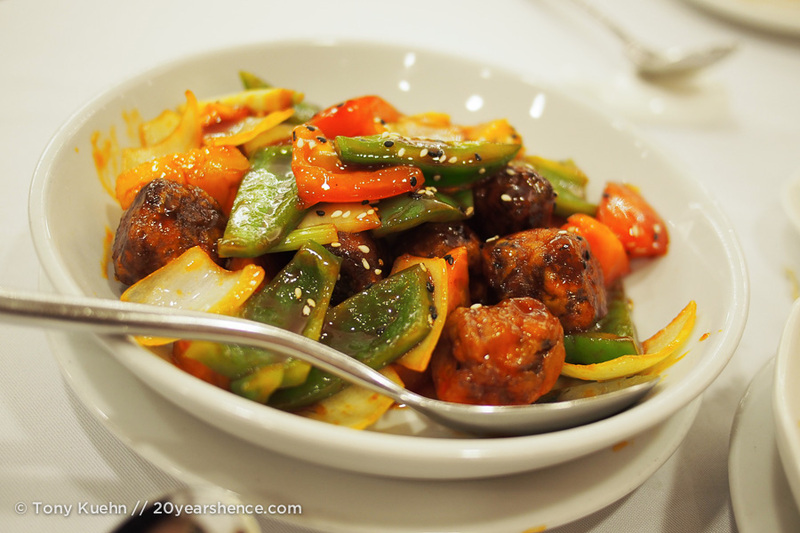 Though we certainly ate our fair share of delicious meat dishes while in HK, the vegetable dishes were awesome as well. Seriously, traveling in this part of the world convinces me I could be a vegetarian if it came down to it! This is AMAZING! I am loving all your Hong Kong posts-I wish we had way more time in Hong Kong now just to keep eating all the dishes you mentioned here! Thanks for all the awesome information, it will certainly help us plan our last couple days here! 🙂 We might give HHK a try tonight! Casey @ A Cruising Couple recently posted..You’re Invited To Celebrate Our Anniversary…In Hong Kong!